User Registration, authentication, password recovery and email certification are critical features requiring back-end infrastructure and security expertise to implement correctly and securely. Let identity.io handle your user management needs so you can focus on the features that make your app unique. Store user-related information in custom attributes and execute business logic with Workflows. 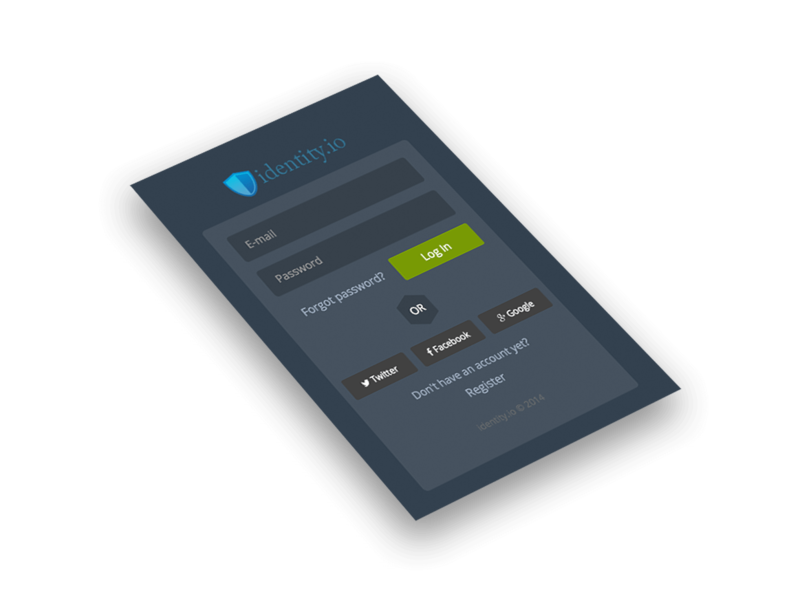 Whether you're a small startup, or a large organization, identity.io can handle your Identity Management needs. Simple to setup and maintain reconciliation, provisioning, role management, auditing and reporting. Control your organization's identity assets directly with our Workflow engine and Sync agents, without the need for highly specialized staff or consultants. Perform all User Management CRUD operations through identity.io's extremely fast REST API. SDKs available for Node.js, Java, Python, Ruby and PHP. Generate usernames dynamically through pre-built Workflow Components, or build your own. Just attach the Component to a Create event and you're done. Add custom attributes and store whatever you need. Store entire JSON objects in custom attributes and unlock endless possibilities. Forgotten password management, password expiration, notifications. Customize how users retrieve forgotten passwords through best practice solutions such as challenge questions, one time password, email link, and more. Every event and action that takes place in identity.io is recorded and logged. Easily see everything that has happened to a user from creation to deletion. Unlock the Self Registration module to allows users to sign up directly. Deploy a templated page hosted by identity.io or use APIs to keep the UI on your end. With the Custom Domain feature, end users will never even need to know we exist. Enforce password complexity through a set of pre-built rules, or easily write your own using the id.io Workflow Designer. Configure account Start Date, End Date, account expirations and renewals and attach custom Workflows to perform your business logic during these events. Setup an organizational hierarchy by assigning users a manager attribute. Using Workflows, you can configure rules to automatically assign a manager where appropriate. Detailed reporting provides visibility and metrics for your enterprise workforce and user base. Use our Authentication APIs to verify your users. You design the front end, we'll authenticate them on our end. Integration and Single Sign On with 3rd parties can be enabled through our Federation features. Easily enable Social logins for your users if your business case requires it. Enable MFA and force your users to enter a randomly generated PIN, on top of their normal login. PINs are generated through mobile apps like Google Authenticator or Authy. The Workflow Designer is a powerful web based workflow editor which allows you to create Identity Workflows. Workflows can be attached to all system events, such as Create, Modify, Add Role, etc... and the id.io Engine coordinates their execution. For example, when creating a user, you generate a display name and password, and send a welcome email. Additionally, you may want to create an account for the user in Active Directory and add this user to a group. With Workflows, you connect the DisplayName, GeneratePassword, CreateAD Components, add a custom group assignment component and you're done. The id.io Engine will execute this workflow next time a user is created. Through embedded machine learning and predictive analytics the id.io Intelligence Engine will adapt to your organization's unique patterns and define the foundation for smart automation. 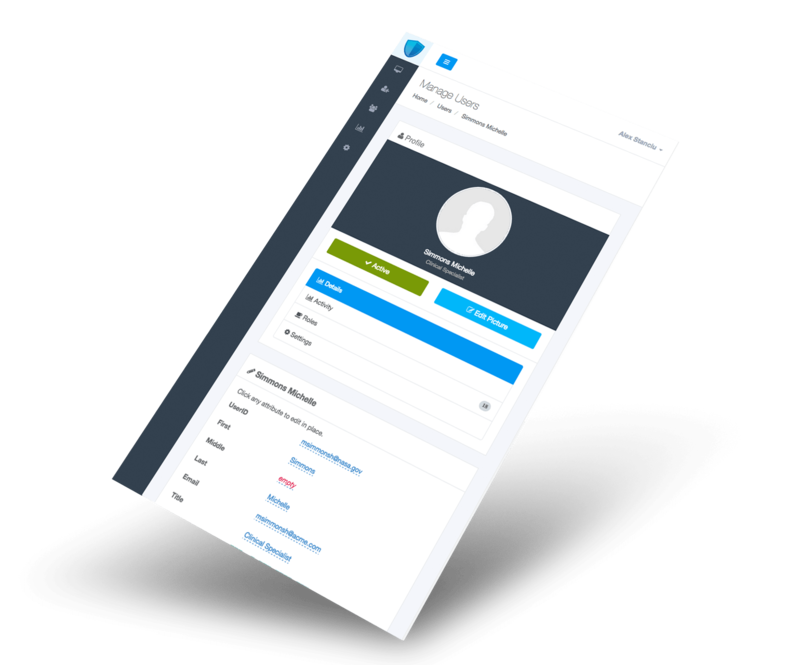 The id.io Intelligence Engine will proactively suggest resources, roles and entitlements that new or existing users might need. Confidence thresholds can be configured to allow automated requests for resources to be submitted. Let the Intelligence Engine monitor the system in real time and send recommendations when usage patterns fall beyond the norm. The engine can also assist human decision making by providing a confidence score during normally scheduled certification tasks. Group and segment your userbase with custom roles. Use Workflows to setup automatic role memberships or kick off workflows from membership events. The id.io Intelligence Engine can predict what roles a user might need and pro-actively suggest them for new users. Simply turn on the LDAP Gateway virtual directory and connect to your identity.io account with any LDAP client. Any application that uses LDAP for authentication can now leverage your identity.io directory, all with the click of a button. Configure your own domain or sub-domain instead of your account's organization.identity.io URL for a fully branded experience for your users. If you prefer to host the identity.io application in your own data center, this option is available for the Enterprise level accounts. We'll provide all the implementation details, reference architecture, detailed documentation and if needed, professional services to assist in a deployment. With this option, you can leverage our scalable architecture designed for extremely high volume. Sync Agents provide a way for systems within your company which are not exposed to the internet to synchronize with identity.io. You can configure Sync Agents as a Reconciliation source or a Provisioning target. Currently, our Sync Agents support LDAP, Database and Flat File target but a lot more will be released. Simple controls to enable one time or scheduled Bulk Load operations. Making mass updates has never been easier. FTP drops, Amazon S3 downloads, API uploads, scriptable command line tools. Sign up to request a private Beta invitation. You'll be the first to know when our beta is available! There was a problem saving your email. If you would let us know directly, we would appreciate it a lot.